With the onset of warmer weather, and the increase of physical activity, I hear that same complaints from my children each and every afternoon. 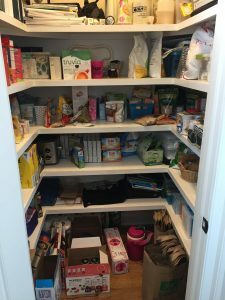 For years, I stuck with what I thought were childhood staples in our pantry, despite my dislike for the clean up. Goldfish, Pirate’s Booty, Chewy Granola bars, and microwave popcorn caused my Costco cart to overflow on a regular basis. The trouble was, with each snack ravenously consumed, my girls were still hungry. And when you couple these processed, carbohydrate-heavy snacks with crippling heat and humidity, it was a recipe for disaster. Being the good nurse practitioner that I am, I know when it’s time to call in my consults. One of my closest friends is a Certified Nutritional Therapy Practitioner, and she has been coaching me over the past year to make healthier and more filling food choices for our family. I sent her a list of the snack foods I’d like our girls to give up and asked her for suggestions for more nutrient-dense and satiating snacks. Below, I will list some snacks we removed from our pantry. I will also include a link to the healthy filling snack we replaced it with, along with a “review” from my family on each of the products. I have found that Thrive Market and Amazon are both excellent resources for dry goods, and are typically cheaper than our local grocery store. These online platforms do have a subscription fee ($60/year for Thrive, $120/year for Amazon Prime), and usually arrive in 2 days. If you make a purchase using one of the links on this page, I will receive a small commission, at no cost to you. Snacks that Needed to be Replaced! 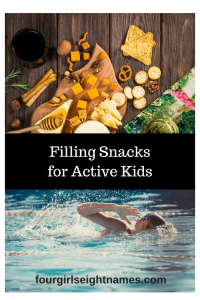 The key here is to replace simple processed carbohydrates (think- all those crunchy, slightly sweet snacks) with a whole food, nutrient dense option that will keep your kids full. 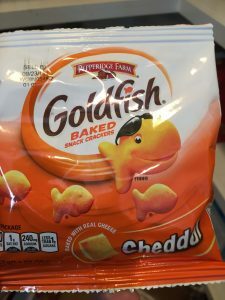 Goldfish have long been my nemesis, mostly because I think they taste gross and they are impossible to clean up, especially when they get stomped on by little feet. More importantly, they don’t keep my girls full, especially when they are outside playing. 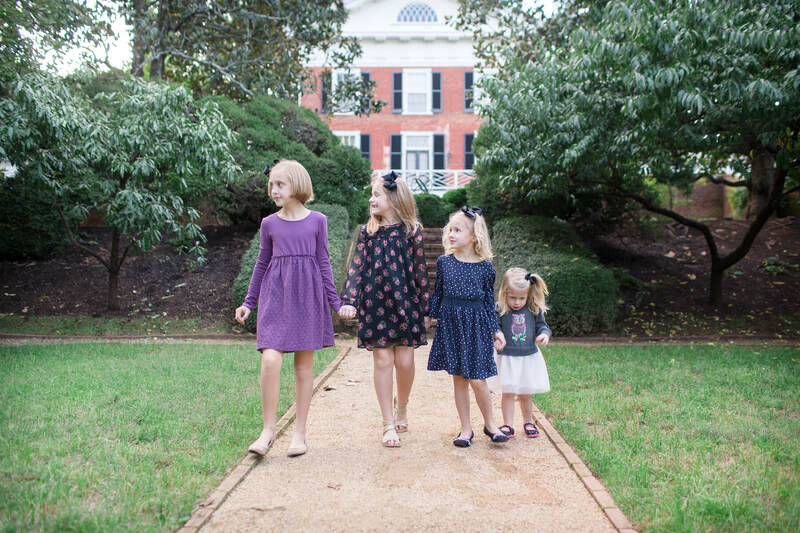 What became a little scary to me was just how addicting they are; after a couple of weeks without them, my girls had some at a birthday party, and you would have thought they had tasted freedom for the first time. Simple Mills almond flour crackers: These were liked by most of my girls, but they were too crunchy for my 2-year-old (who has dysphagia) to eat. Whole Milk Cheese: We found a brand, KerryGold, that is carried at our local Whole Foods that the girls enjoyed. This whole fat cheese from grass fed cows has strong staying power for active kids, and we toted it around in our favorite portable cooler. 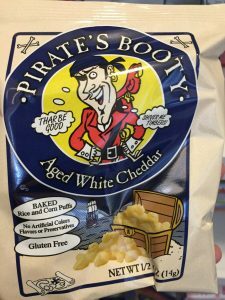 Pirate’s Booty, though delicious, doesn’t keep my kids full at all, and it’s not cheap! To replace it, we used Pork Rinds, which come in a variety of flavors, and are cooked in fats that will help with satiety. The Engineer was the biggest fan of this transition. 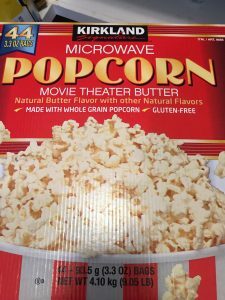 Though it’s tough to pass up a huge box of popcorn that costs about $3, this wasn’t the best option. Instead, we substituted with a brand that cooked with coconut oil, which helps keep active kids full. You can also top it with butter and nutritional yeast, which offers additional umami flavor. I found this fats chart to be especially helpful when deciding on which fats to choose. 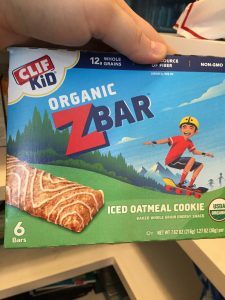 Clif Bars were tough to change in our house, especially for one child who eats them by the box! I wanted to search for another soft granola bar with less sugar, so we could at least alternate these with another option. We found Lara bars to be the solution; they are soft enough for our daughter with dysphagia to eat. The toughest part of this transition was convincing my children to stick to the new habits we worked to cultivate. I made a chart for our pantry and refrigerator that reminds our girls which snack is best for fueling their growing, active bodies. I would love to send you a copy of the chart as an opt-in for my email list. If you could replace one snack that your kids eat, what would it be? What options have worked (or not worked) in the past? This write-up is extremely useful. I love that you dug in and did extra homework to find the best of the best snack options for your little ones. I also am a firm believer in nutritious meals and snacks. I am that mom that reads the label on the back of the boxes at the grocery store. That’s such a smart thing to do! It’s amazing how much sugar or additives can be hiding in the food we give our kids. My family loves Goldfish too. But I also offer plenty of fresh fruit and veggies. We also love cheese. It’s really hard to switch to healthy snacks. My son is still 6 months old, I am hoping we can start him early so that we don’t have to go through the hard transition. I agree- the transition is tough! Especially when our kids are frequently tempted! I completely agree! The prep that goes into providing healthy snacks could be a full time job. I’ve just started allowing my 8 year old to help with chopping up fruits to help me. Your daughters are too cute. My daughter loves biscuits so instead of buying we just bake her snacks together. Thanks 🙂 That’s a great idea to spend time together! So nice to have that friend! Please more switches the world needs to know healthy whole food is the way to go!